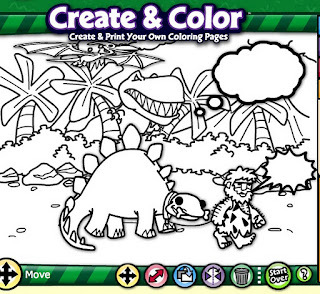 Crayola offers a facility to create your own colouring pages. 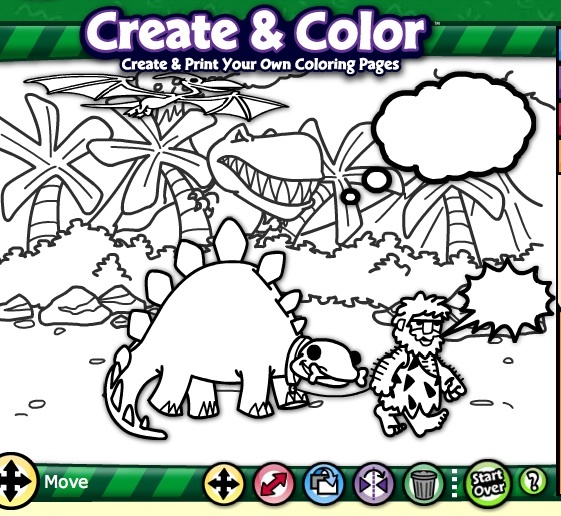 You can choose from different backgrounds and characters, then add speech bubbles. Once you're happy with the arrangement of a page, print it out, then colour and add text to your speech bubbles. Starting with a picture they can arrange themselves, and speech bubbles just begging for dialogue is a wonderful prompt for children's own writing. There are several fantasy and futuristic themes that will engage kids too. Crayola has more creative activities like this. Check out Vehicle Mixer on the Games page, where youngsters can mix and match to create their own strange vehicles. Here's where to find all the Crayola games. Most of the comic makers can be used in a similar way - that is, you can leave speech bubbles blank, print your comic or cartoon, and have kids add their own text on the printed copy. You can try it particularly with Make Beliefs Comix, which is mostly black and white (don't choose a coloured background.) But all the online comic makers will work that way - just remember to have kids add speech bubbles, and leave them blank. This is a great way to sneak some writing into children's lives, and means their screen time is educational and creative. Recent posts about comic makers have been about the Charlotte's Web Comic Maker, the Toon Books Comic Maker, the Arthur Comic Creator, and the Boy's Life Comic Creator. That sounds fab, thanks for sharing!